The Plusher Reclining Living Room Group by Best Home Furnishings at Best Home Furnishings in the St. Louis, Chesterfield, St. Charles, MO & Waterloo, Belleville, Edwardsville, IL area. Product availability may vary. Contact us for the most current availability on this product. Arm Type Pillow padded arm rests. Like relaxing on a cloud, the Plusher collection is just as soft and welcoming as its name implies. Plush, plump back cushions, individually channeled with fiber provide gentle and resilient support as you lounge. Biscuit back padding subtly dresses up this look. 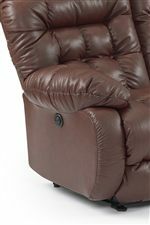 Choose from the Plusher reclining sofa, console loveseat, or rocker recliner, all available with manual or power recline. A stunning array of fabric and leather colors are available to help match this cozy, comfortable look to your specific room decor. The Plusher collection is a great option if you are looking for Casual furniture in the St. Louis, Chesterfield, St. Charles, MO & Waterloo, Belleville, Edwardsville, IL area. Browse other items in the Plusher collection from Best Home Furnishings in the St. Louis, Chesterfield, St. Charles, MO & Waterloo, Belleville, Edwardsville, IL area.